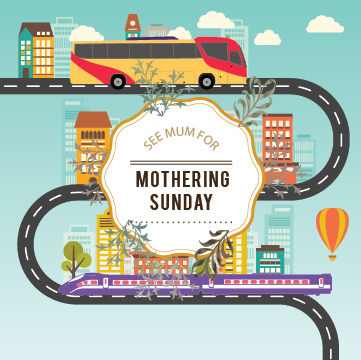 Mothering Sunday is March 6 in the UK, and if you’re planning to go see Mum, there are no shortage of transit options. The UK offers over 100 ferry routes to France, Ireland, Belgium, Spain and more! This is a great option if you want to have your car with you when you get to your destination. Does mum live closer than a ferry ride away? Pick her up and take her on an outing! Take the ferry, then take a drive through the countryside. Coaches are a lovely way to get around Britain, allowing you to relax and enjoy the sights instead of worrying about driving. They’re also one of the least expensive ways to travel, so if you’ve thought that you couldn’t afford to see Mum this year, maybe an inexpensive coach ride is the way to go. If you need to quickly get from London to Paris, the undersea train can get you there in just over 2 hours. There aren’t many places in the world where you can hop over to another country for lunch, so take advantage of where you live and take mom out to see the sights and enjoy some new cuisine. For smaller, local trips, bus and rail offer convenience and speed. You don’t have to worry about parking your car or the wear and tear on your vehicle. If Mum takes a ride with you, and she’s worried about safety, let her know that the bus and train are safer than driving. Traveling this way will also give the two of you the chance to fully connect with each other during the ride, rather than you being focus on traffic. And if you have kids and bring them along, they’ll love the bus or the train, and Grandma will love watching their excitement! Whichever way you choose to see Mum this year, we hope you have a lovely day together! Happy Mothering Sunday from AddTransit!